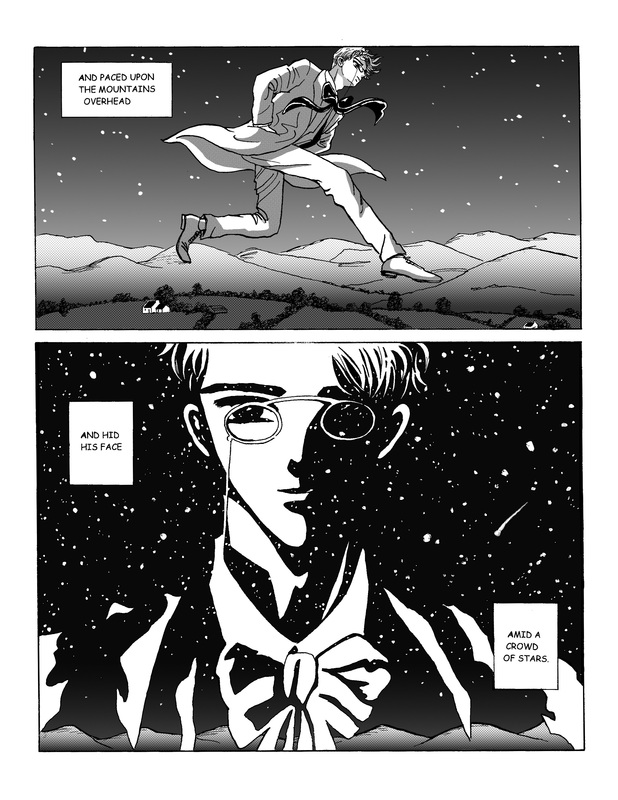 My adaptation of Yeats’ 1893 poem, done in the manner of a Japanese manga. The style is a tribute to the beautiful Shojo manga (girls’ comics) created by the “Clamp” collective in the early 90s. 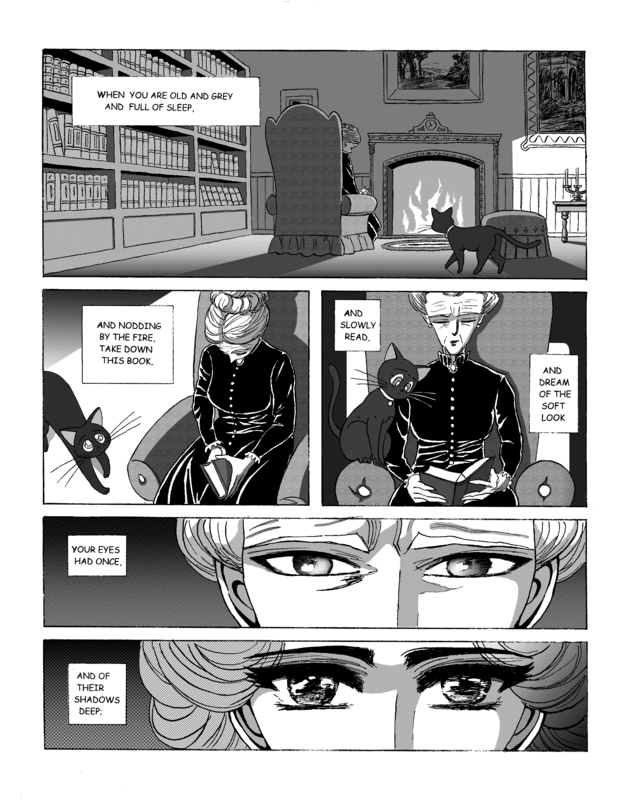 The manga-style screentones are by the illustrator and artist Maryse Daniel. Click on images to enlarge. Just to say that this is so incredibly beautiful. I have always loved this Yeats poem and it has taken on even more meaning since, not so long ago, things ended with my Irish fiancee. The beautiful artwork really brings out the emotion in the poem and it really deserves to be seen by lots of people. Truly lovely. Thanks catfish28! That’s really nice to know. If ever there was a poem that didn’t need to be illustrated, it’s this one. You are so versatile in your style; it’s a delight and wonder to see / read your adaptations of poems. A poet myself, albeit not yet courageous enough to pursue publication, I would love my lines to be illustrated in such a manner. Thanks! I hope you keep up writing poetry, and that the courage comes. Brilliant, and beautifully done. You definitely brought out certain lines in ways that some great readers’ voices did not. You’ve inspired me to record this one and link back to this. YOU. You are absolutely brilliant and your art renditions of some of my favorite poems (this one. Prufrock, the Drunken Boat) are the best thing I’ve seen. In love with your work. I never fully appreciated this poem until reading it here. 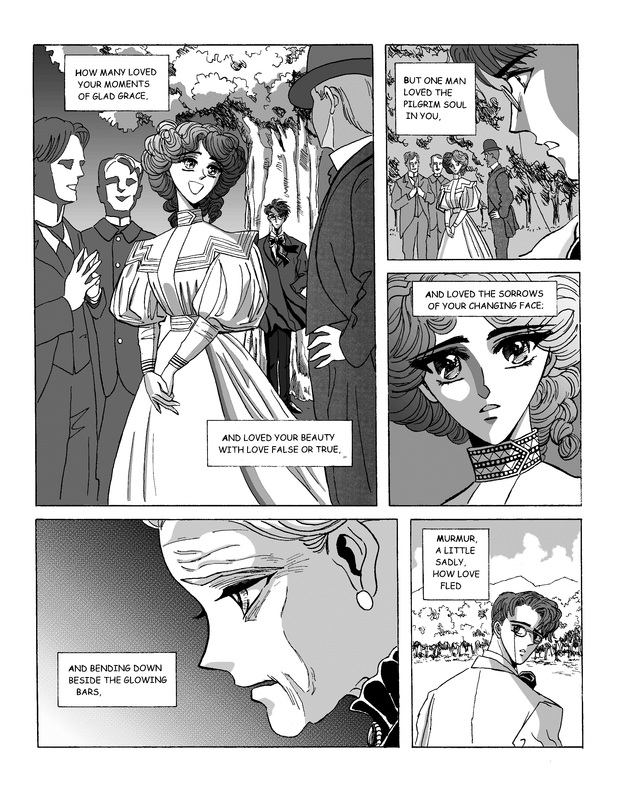 The manga style brings out the depth of meaning. I cried. Thanks. This saved my day. I really love this poem and Yeats. And read in this beautiful shoujo art style. Thanks. Absolutely beautifully enchanting rendition of this poem!!! Thoroughly enjoyed this, well done Julian. You have another fan in Oz!. My blogs about you. Simply amazing work. Thank you Vinita. I’m flattered! Wow! That’s terrific! Thanks for letting me know! your capacity to capture the soul of a poem amazes me! 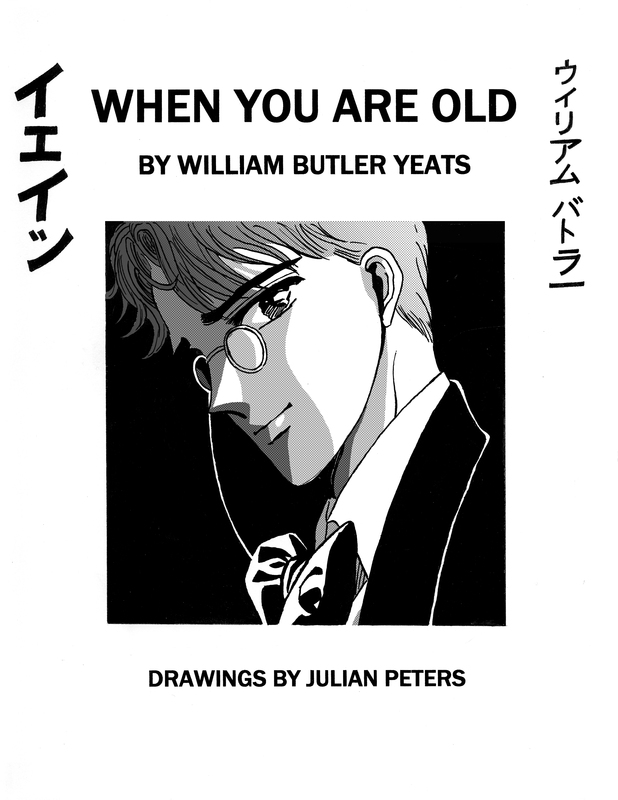 You got the rhythm of Yeats terrifically. You dealt with his Yeatsian ‘brevity’ with panache ! Loved it. Mr Peters, you have a chameleon heart, or pencil, and art. These humorous and changing skins of yours are very pleasantly entertaining. Thank you, thank you. Thanks! A studio arts professor I once had warned the class not to privilege one particular style too quickly, as it would limit our growth as artists. I have taken his advice to heart, perhaps for a longer period than the professor had intended. Are you Diane Paquin who wrote On growing up please? Presenting On growing up this Monday at school in class to encourage young people to appreciate poem but couldn’t find anything on the poet who wrote it -Diane Paquin, hence the question. SL, Nothing that I wrote has ever been published except a critic on a show, long ago. Julian, I linked to your site from Renee LaTulippe’s blog NWR (No Water River) and I’m so glad I invited myself in. I love the close up of the eyes, the emotions illustrated gives me such a deep soulful longing. This is really good! Thanks a lot! Japanese manga eyes are indeed incredibly soulful. In fact it was probably Yeats’ line about the woman’s eyes with “their shadows deep” that gave me the idea of adapting this poem in this particular style. This is really beautiful, impressive, exciting! I linked to it on my blog today (the Yeats “Lake Isle of Innisfree” post). So happy to have found your blog! Thanks so much! I really liked you “Innisfree” post; it’s a rare things these days to see such bursting enthusiasm for classic poetry. I’m sure you have gotten a lot of people excited about poetry again!